Your home’s heating and cooling system is not only responsible for keeping your family comfortable, it is also the single system in your home that has the largest impact on your utility costs. If your heating system in Weatherford, TX is outdated, not running properly, or not working to its highest efficiently, your utility bills can skyrocket in the cooler Texas months. Lightfoot Mechanical specializes in keeping your costs low and your home comfortable by offering cost-effective, high-efficiency heating solutions. We specialize in furnace replacement, installation, repair and maintenance for natural gas, electric and oil furnaces, boilers and gas and electric heating pumps. Our employees are trustworthy and our HVAC services set the standard for customer satisfaction in Weatherford, TX and all surrounding areas. Trust and reputation are the keys to our customer satisfaction at Lightfoot Mechanical. We constantly strive to exceed our customers’ expectations and earn their confidence. Lightfoot Mechanical will never charge you upfront costs and will always fully disclose all charges before work begins. Our contracts are easy to understand and contain no fine print. Our business is fully bonded and insured, and we pull all required permits on any work done. When you call Lightfoot Mechanical, you can rest assured you are working with reliable professionals. All Lightfoot Mechanical employees are background screened and drug tested. Whether you need maintenance, cleaning, repair or are ready to replace your system with a new high-efficiency one, we’re the company to call. When temperatures start to drop in Texas, make sure you are prepared for the cold weather with an efficient heating system you can rely on. At Lightfoot Mechanical, our skilled Weatherford heating specialists are fully trained to tackle any problems you may experience with your heating and cooling system, from repairs and maintenance to carrying out full replacements before it starts to get cold. For the safety and comfort of your family, it is important to schedule a regular heating system check, to prevent any future faults with your heating unit. The technicians at Lightfoot Mechanical use a twenty-six point check plan to maintain and tune up your heating system, which includes aspects such as checking for carbon monoxide leaks, inspecting the safety switches and changing the air filter. Your heating unit should be monitored at least one to two times throughout the year, particularly in the fall months. This will allow time for any repairs to take place, if necessary before the temperature falls. If you have begun to notice a problem with the way your heating system is performing, the first thing to do is arrange an appointment with one of our experts. Any faults with your system could cost you more in your energy bills, as it will reduce the efficiency of your system. This is not something you want to have happen during the coldest months of the year when you need your system the most. The Techs at Lightfoot Mechanical are able to carry out affordable heating repairs, no matter how large or small the issue. Our repairs are done quickly to avoid any inconvenience to you, and we aim to be on the job as swiftly as possible to restore your heating system. While most heating systems have an average lifespan of around ten to fifteen years, eventually you will need a heating unit replacement. Our well trained specialists can advise the best make and model for your needs and install your new unit to the highest standards. As a significant change to your home, our contractors will be able to answer any questions you may have and will only suggest a replacement if your current system is old, unreliable during the wintertime, or it would cost you more for the repairs than the price of a new, improved heating unit. You may choose to heat your home with a heat pump, which removes the heat from your home during the summer months and emits heat when you need it in the wintertime. Lightfoot Mechanical can also help you with heat pump repairs, ensuring the pump in your home performs efficiently, without any faults or issues. While heat pumps are one of the most energy efficient methods of heating your home, they need to be maintained all year round. The savings you make through using a heat pump can help to cover any repairs needed to ensure it continues to work when you need it most, saving you money in the long term. Heat pumps are also more technical than other forms of heating systems; our contractors are fully licensed to work with all heat pump models to a high, professional standard. heat pump replacement, which the specialists at Lightfoot Mechanical are fully qualified to carry out. The efficiency of your heat pump will drop after approximately ten years, meaning you will save around 20% on your household energy bills by replacing it. We can help you select a new model and install it with minimal fuss, ensuring you are ready for the winter months. At Lightfoot Mechanical, we will also remove your old unit and take care of any additional ductwork that is necessary, at a reasonable cost. Furnaces require a significant amount of maintenance to ensure an efficient performance. Our technicians are able to carry out a furnace system check in your home, identifying any small problems and fixing these, while inspecting your furnace to test the heat delivery system and air ducts. During this time, we will check the airflow of the ducts, check the ignition and the exhaust, and make sure there is no chance of a gas leak. By having our experts carry out a tune-up of your furnace system, you can ensure the safety and comfort of your family. Any unusual problems or issues that occur with your heating system could potentially pose a danger to you and your family, so it is vital that you call for a furnace repair as soon as you notice any difference in performance. We will respond to your call out quickly, fixing any problems to prolong the lifespan of your furnace. Fixing issues earlier will save you money on any future major repairs that may be more difficult to address. The average lifespan of your furnace should be approximately up to twenty years as they can last a long time without losing any efficiency when heating your home. After this period, it is recommended that you invest in a furnace replacement for your home, as the winter months can put an enormous amount of stress and pressure on your system. Our contractors can replace and install any model and brand of furnace, saving you the time and hassle of attempting to find the right furnace for your home. Regular maintenance will ensure your furnace does not unexpectedly break down when you need it the most. However, eventually, you will need to replace it for a newer model. If you notice any unusual sounds, moisture, or rust from your furnace, this is an indicator that it is time to replace your current system. This can be easily and quickly taken care of by our specialists at Lightfoot Mechanical. With all of the maintenance and upkeep required around your home, it’s easy to overlook your heating system. But not taking the time out to keep your furnace properly maintained is a costly mistake. Not only is maintenance and cleaning necessary to keep your utility costs low, being sure your system is properly maintained will also prolong the life of the system. At Lightfoot Mechanical, we are dedicated to making sure your heating system lasts as long as it possibly can and runs as efficiently as possible. Let us help you keep your furnace running its best by scheduling regular maintenance. A dirty furnace also leads to an inefficient furnace. There are three important areas of a furnace that need to stay clean to keep your system running properly: the filter, the blower and the blower motor. One of the most important and easiest steps in keeping your furnace working properly is cleaning your filter. The filter should should be replaced at the beginning of the heating season, but then you should follow your manufacturer’s recommendation throughout the season. When it comes to the more difficult cleaning tasks like cleaning the blower and blower motor, it’s best tocall a professional. Cleaning these essential parts of your furnace requires removal of panels that house these parts, as well as removal of the fan unit. Furnace cleaning is part of our regular furnace maintenance program, and at Lightfoot Mechanical we stand behind our work. Lightfoot Mechanical is the leading heating repair expert in North Texas. We repair more residential heating systems than any other heating company in our area. When you’re looking for furnace repair in Weatherford, Texas, and all of North Texas, make sure you call on the company that has the most experience with repairing residential furnace repair. 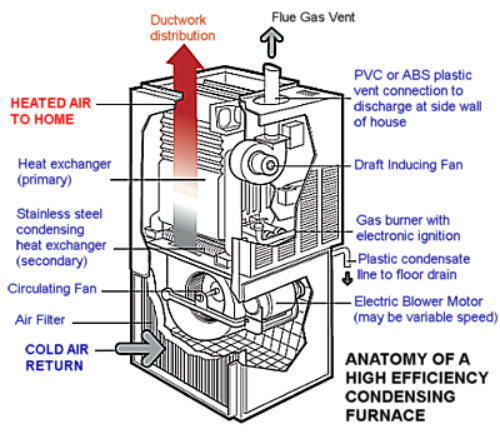 Having Trouble with Your Gas Furnace? If your heating system is in need of replacing, there are several things to consider. Even if your system is not broken, an upgrade can save you money. Our new, high-efficiency units work so well they can lower your monthly utility bills to a point where you will actually save money. When you decide it’s time for a replacement, we’ve got the expertise to be sure you get the right system for your home, the professional experience to correctly install your new system and financing options to fit your budget. Time for a New Heating System? We’ve Got You Covered. Don’t forget, Proper Installation is Key to an Efficient Heating System. Leading heating and cooling professionals agree that the single most important part of furnace replacement is selecting a qualified contractor to install the unit properly and continue regular maintenance. At Lightfoot Mechanical, we strive to make every furnace installation the best you could possibly ask for. A Lightfoot Mechanical furnace installation in Weatherford, TX starts with our Comfort Advisors, who have extensive industry training and experience to properly size your new heating system to your home. The Comfort Advisor goes beyond the heating system and looksat your home’s overall efficiency. This includes such things as attic insulation, square footage, heat loss calculations, humidity levels and more. Once the Comfort Advisor completely understands the technical layout and requirements, they make sure you understand your options regarding system efficiency levels, comfort considerations and budget and financing. When it comes to the actual installation, you will know you have hired the industry’s “A-Team” from the minute the Lightfoot Mechanical installers arrive on the job. Not only will they make sure your system functions properly, they will make it look good as well. The heating unit will be leveled and squared, all electrical connections will be tight and secure, and all joints sealed and tightened. After the installers leave, you won’t even be able to tell they were there. We promise to leave your home as clean, if not cleaner, than you left it. Finally, we stand behind our furnace installations with an industry leading satisfaction warranty.